Short time before release day I started to work on a tweaking tool. Initially it was available for friends only, but why not for the community? 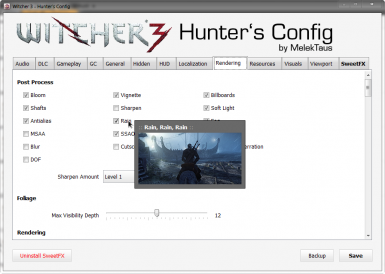 W3HC - Witcher 3 - Hunter's Config is a tool for configuring/tweaking Witcher 3. It only changes the values of 11 INI-files and the user.settings-file. So it's only a GUI that makes raw text more readable. 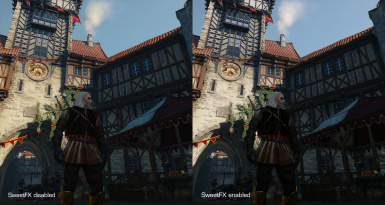 Optional: I add my SweetFX preset for slightly less saturation. • "Standalone" Application [.exe] - incl. JRE, i.e. No Java installation needed! • FRAPS and other overlay apps in combination with SweetFX could cause a crash! • You have to run the game at least one time and quit it with the "normal menu way" before using W3HC!